If ever there was a prime west-end address this is it. Nestled between the shores of Lake Ontario and the southern edge of High Park, this high-rise development promises the recreation lover miles of walking and cycling paths, lakefront sunsets and a short commute into the heart of downtown Toronto. Introducing the luxurious Swansea condominium project, Mirabella Condo Project is slated for occupancy in 2021. This prime piece of land sits at 1926 Lake Shore Boulevard West, just east of Windermere Avenue. It’s a mixed-use project, consisting of two 35 storey condominium towers flanking a five-storey podium. 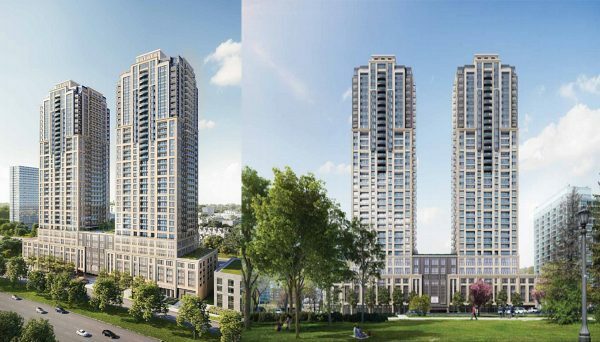 Including the two towers and the podium, the structure will house 760 luxury residential units, with retail space on the ground floor, fronting Lakeshore Boulevard. Indoor and outdoor amenity space occupies the top level of the podium, just calling out for you to throw a five-star dinner party on the terrace, showcasing unparalleled waterfront views in the distance. High-end amenities have been designed with the modern, urban homeowner in mind. All units will feature 9 foot ceilings except the penthouses which will boast 10 foot ceilings. Suites will be off-white with a smooth finish ceiling and with a choice of plank pre-finished laminate flooring in bedrooms, kitchens, dens, living/dining areas and the entry corridor. Sliding doors will also give access to balconies or terraces. Sliding doors will also be included in bedrooms with the exception of the internal bedrooms which will feature clear glass sliding doors. Additional finishings include porcelain tile finishing’s in the laundry area, contemporary mirror sliding doors on entry door closets, and brushed nickel contemporary hardware. A core suite entry door with deadbolt lock and a security viewer will also be included. A luxurious executive work centre will be available for those who work from home, or take work home. The towers will boast a designer appointed lobby, cozy library with a gas fireplace, full kitchen, and two furnished guest suites. Residents with pets will also enjoy the convenience of having a pet grooming area on ground floor. Other amenities include a customized children’s play area, men’s and women’s change rooms, indoor pool, outdoor play patio, indoor pool, yoga studio, and state-of-the-art fitness studio. A party room will also be open for use, complete with a fireplace and ceiling windows allowing for a stunning view of the lake and access to the outside landscaping. 10,000 sq ft. of landscaped outdoor garden will also be made available for use, as well as 10,000 sq ft. of private indoor amenity space for the East Tower. The outdoor gardens will feature dining tables, seating arrangements, BBQs and Outdoor gardens include BBQs, dining tables, seating and natural plantings, making for the perfect summer outdoor get together option. The developers have tapped Scott Shields Architects to design this waterfront condo, a renowned boutique firm they’ve successfully partnered with on other luxury buildings. Renderings for the condo show a structure that complements much of the existing waterfront buildings, while presenting as an iconic destination in itself. Elegant concrete bands combined with oversized glazed windows give the building a stately look, while ornate details are a perfect representation of the grand lifestyle that awaits the residents. This could be your last chance to invest in a prime Toronto waterfront property. Combining scenic views of sailboats gently cruising the sparkling Lake Ontario, magazine-worthy sunsets, boardwalk strolls and lush parkland, this site is a dream come true. Residents have direct access to the Martin Goodman Trail, a 56-kilometre walking and cycling path that runs along the entire city’s waterfront, Sunnyside Boardwalk and of course High Park, one of Toronto’s major attractions. High Park spans 400 acres, with a third of that remaining in its natural state, dotted with oak forests, stately willows and Cherry Blossom trees. The rest of the park houses sprawling picnic areas, landscaped gardens, a pool, tennis court, restaurant and amphitheatre, even a zoo. This is literally in your backyard. The heart of downtown is only a ten-minute drive away, yet this Toronto waterfront condo seems entirely removed from the congestion of the core. For those commuting elsewhere, both the Gardiner Expressway and Lake Shore Boulevard West are nearby. For shopping, dining or exploring, some of Toronto’s most eclectic neighbourhoods are minutes away, including Parkdale, Roncesvalles and Liberty Village. 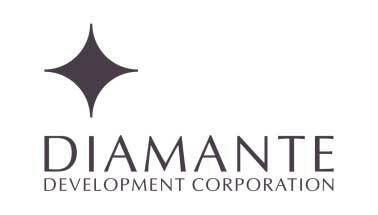 Diamante Development Corporation is a full-service company, handling the planning, development, marketing, sales, construction and property management of their projects, which can be found in some of Toronto’s most desirable neighbourhoods. They received BILD Toronto’s Project of the Year Award three years in a row, an unprecedented achievement. Diamante’s projects feature outstanding attention to detail, ornate finishes and a thoughtful and socially conscious approach to the locations and designs of their structures.